The Ficep plate duplicators eliminate the time consuming layout and hole production that is associated with the production of plate and angle detail components. 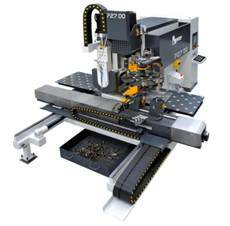 A hydraulic punching head, in conjunction with an optional drilling head, gives the Ficep plate duplicators the capability to process applications that require either punching or drilling. 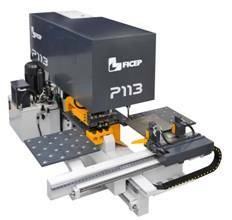 Ficep Corporation offers a complete line of two-axis CNC controlled plate detail punches for processing both plates and angle material. All systems feature a Windows based CNC control which is provided with the proprietary Ficep software that permits remote troubleshooting with an internet connection. This type of automation eliminates all manual layout and enhances the total productivity when producing plate and angle detail components. All systems feature automatic material repositioning in the length axis to increase the total length of the part that can be processed. Y axis range 19-5/8" 31-1/2"
Maximum hole size 1-3/4" 1-3/4"
Maximum punch thickness 1" 1"
Maximum drill thickness 1-9/16" 1-3/4"
Many plate-processing applications do not permit punching because of the material thickness and distortion caused by punching or building code restrictions. In these cases Ficep offers a two axis CNC plate drilling system to process these plates in a cost effect manner.